September 16, 2016 - Posted by	Christina MacPherson | legal, South Australia, Submissions to Royal Commission S.A.
A recent poll suggests 48% of South Australians support a nuclear waste dump in regional SA yet I cannot find one single person who supports it – maybe I am consulting with the wrong people. Even a cursory look at the Nuclear industry in Taiwan – Taiwan being one of the proposed dumpers in SA – will reveal that the Taiwanese government is having a lot of trouble disposing of its waste – much of which is currently being stored on one of its small islands with Aboriginal populace who strongly protest the storage; Taiwan is in fact closing down it s 6 nuclear reactors because they are (a) too costly, (b) too dangerous and (c) have produced numerous problems with waste disposal…Because the containers already have started to rust and decompose. SA has seen huge increases in electricity prices which, some might argue, is linked to the promotion of “cheaper” nuclear energy. 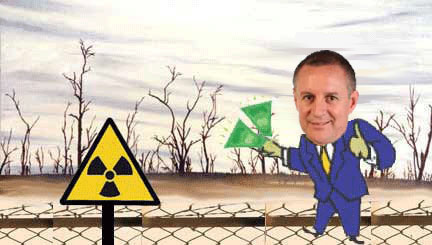 With Liberal Senator Sean Edwards making statements such as “I want South Australia to become a nuclear powered state”, is it any wonder both sides of the politics have their advocates? Seems we are headed for self-contained nuclear power and nuclear waste disposal in the state. The new military contracts for submarines being built in SA appear to include provisions for nuclear powered submarines (or retro-fits) so this might also be why there is a push for a nuclear dump nearby… Some of the large military contractors already are above the law: with nightly helicopter training of FLIR camera testing – which surely impinges on privacy laws – in the Western suburbs during Adelaide Airport’s curfew hours, for example. South Australians know that the proposed “huge” profits will never, ever be seen by them… But they have seen enough images of local politicians “fleecing the public” then leaving with the proverbial suitcases full of cash for far-off overseas destinations.